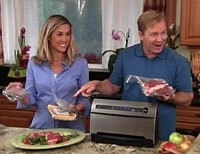 The latest infomercial for the Food Saver Vacuum Sealer blatantly rips-off the legendary Magic Bullet infomercial. As in the Magic Bullet infomercial, a couple (presumably married) gathers people into their kitchen and forces them to watch an appliance. But the characters in the FoodSaver infomercial differ from those of the Magic Bullet in that they are all BORING AS HELL! No chain-smoking barfly or drunken party animal shows up at the shindig of Beau Rials and his wife Lanae. Veteran infomercial host Beau Rials (think Mick with a Southern accent) and his wife Lanae (Beau’s Mimi) have their “family” over to their house. Because these people are family and not Beau’s hung-over party friends, the Food Saver infomercial resembles the Bullet Express infomercial in that respect. Although Beau calls these people “family,” he never tells us how they are related to each other or to Beau and his wife. One difference between the FoodSaver infomercial and the Magic Bullet infomercial is that Beau admits up front that they are going to submit their guests to “an experiment we’ve been planning.” At least they were warned. 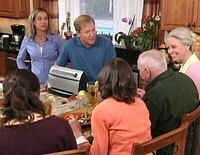 At the beginning of the infomercial Joe and Judith are sitting at Beau’s kitchen table. Bald and skeptical, Joe is supposed to be the Berman character. Beau even likes giving Joe grief, just like Mick did with Berman. Joe, however, is not overweight and never mentions any consumption of alcohol—although he is very impressed at the way the Food Saver can crush empty beer cans. Judith is sort of like Tina was in the Magic Bullet infomercial: she asks a lot of naive questions and is far too easily amazed by everything her hosts do. 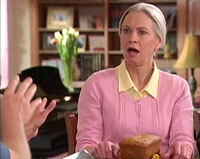 Later on an older woman named Betty arrives with banana bread. Although Betty mentions having grandchildren, she mainly seems very protective of her banana bread. Betty lacks the acid tongue and the filthy mouth of Granny in the Bullet Express infomercial. Finally, a woman named Alisa arrives. Alisa is Asian, so if she is related to Beau and his wife it would most likely be through marriage, although her husband is no where to be found. The first thing out of Alisa’s mouth is “Did I hear somebody say something about a FoodSaver system?” so maybe she is just a neighbor who wanders the streets hoping to come across kitchen gadget demos. Alisa’s main purpose here is to tell everyone that she already owns a Food Saver, giving Beau an opportunity to inform her that the new model is different because it uses SmartSeal™ Technology. Boy, the excitement on this program never stops!! God how I miss the old versions of the Food Saver with Nancy Nelson & Jan Muller. They were a lot better than these ones. Hell even the one with Sully was vastly better than this. Can I expect a full review coming soon? I just saw this, and I thought about the Magic Bullet similarity…and then I thought about coming to your blog to tell you, but you’ve beaten me to it, obviously (by over a month, no less)! I love how much FUN everybody keeps saying Food Saver is, including “This is fun and all, but…” and “Have you ever seen her this excited about anything? ?” CAN’T.HANDLE.THIS.MUCH.FUN. @Kyle: Seriously though, what isn’t better with Sully??? You’re an idiot. Seriously. The only thing sadder than having enough time to compile and create this page is having enough time to comment on it… like me. Seriously, though, the infomercials were simply created by and for the same conglomerate corporation. Often, these kinds of corps don’t have the time or interest to rewrite scripts, so they simply modify existing materials.